UPDATED: Thu., Feb. 28, 2019, 2:18 p.m.
Maybe the snow kept you away from the small ball tournament at the Spokane Arena on Wednesday. Or maybe you peeked at the schedule and discovered that the headliner – the kid with the Gonzaga seal of approval – doesn’t go on until Thursday, after the warm-up acts. But just as college basketball has managed to go on without Zion, the B tournament doesn’t stop just because Brock Ravet of Kittitas hasn’t laced up his shoes yet – though that’s certainly must-see stuff. It’s just that Ryan Moffet had a little must-see thing going on Wednesday evening himself. No surprise there. Odessa’s junior guard is good for 32 points on an average night, so the surprise was that it took him a full 4 minutes to get on the board against Neah Bay in the State 1B round of 12. But the game was already racehorse enough at that point to know it was going to be a night for point-makers. In Moffet’s case, 48 points. Two of them, a pair of free throws with 23.6 seconds remaining, pushed him past Almira/Coulee-Hartline’s Derek Isaak for 1B tournament’s single-game scoring record. Isaak had torched Valley Christian for 44 points in 2012, breaking the previous record of 36 established in 2009. By a kid named Adrian Moffet. And truth be told, topping older brother – who did his scoring for Moses Lake Christian – seemed to be a much bigger deal. Otherwise, it was just doing what had to be done in helping the Tigers to an 81-73 victory. Wednesday basketball at the Arena is an angst-ridden animal, it being a win-or-go-home proposition in the weird compromise of a 12-team bracket. This wasn’t looking like a huge sweat for the Tigers, who built a 15-point lead as Moffet scored his first 34 points. Then the Red Devils realized the 465-mile haul back to Cape Flattery was going to feel even longer after just one run on the court and applied some tension. But 14 points by Moffet in the last 3:22 made it all go away – a left-alone 3-pointer that restored the Tigers’ lead being the biggie. But, c’mon – there aren’t going to be any one-point nights with Ryan Moffet. Which hardly means it isn’t little town teamwork. It’s just a different kind. They figure the ball will get in the hole somehow. On Wednesday, Moffet got his 48 on just 24 field-goal attempts. He can shoot 3s – 5 of 9 this night – and drive downhill, scoring in traffic or drawing fouls (he was 13 of 14 from the line). And, no, he’s not the ultimate team player. After all, he showed up at the Arena without the trademark Odessa ’do sported by his teammates. Having a player like Moffet no doubt reduces the stress. 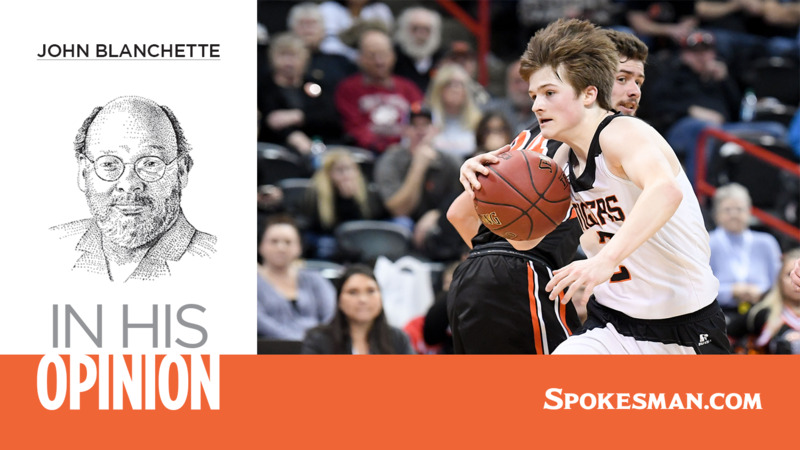 It’s hard to think of such a point-maker as under the radar at a small-school tournament, except that he doesn’t play for the two-time defending champs and he hasn’t signed to play for the Zags and he isn’t the most prolific scorer in Washington history – yet. Ravet just became the first 3,000-point man; Moffet is at 2,332, which means another 700-point season will put him over that benchmark, too. The must-see stuff is just getting started, it seems. Published: Feb. 27, 2019, 10:53 p.m. Updated: Feb. 28, 2019, 2:18 p.m.